Q: How Plan helped you and your family? A: My family was poor and the 11 of us used to live in a cramped house with no toilet and a roof made of straw. My father worked at a factory and was the breadwinner of the family while my mother took care of the family, but sometimes she had to work to make extra money. One day, a staff of Plan came to our house and asked about our family situation minutely. Later, we were informed that my 7-year-old brother was enrolled as a sponsored child of Plan. After becoming a sponsored family, my brother and I were able to go to school. Our living environment had improved too. Plan helped us build toilet and replace the roof with solid materials. We also received financial aid from Plan and we could raise goat to become self-sufficient. Q: Why you decided to work at Plan? A: I had some free time after graduating from high school so I volunteered for Plan. I was responsible for taking pictures and writing letters on behalf of sponsored children. I also helped form a child club in my community and organized different activities for children to participate in after school. From then on, my interest towards development work slowly grew and I decided to join Plan after finishing my master degree. Q: What’s your favourite part about working at Plan? Have you learnt anything from your work? A: I love to talk to children and listen to their stories. Then, I can present their stories in various forms such as words, photos and videos to various audiences. Meanwhile, I love to arrange visits for people from different walks of life. I have learnt a lot from the visitors as they come from different countries and cultural backgrounds. Shreeram loves to talk to children about their future and hope. Q: What is your most memorable experience while working at Plan? A: Very often I have to arrange media visits so that the outside world can know more about our work. I recalled that I once brought some TV crews from South Korea to the Nepal-India border to take a look. As the crews were carrying cameras, the India police suspected us of taking pictures of the border activities. I tried to explain to the police that we were not intended to breach any regulations. We were detained for 2 hours before we could leave! The lesson I learned is to spend more time on preparation before organising visits. Q: What makes you continue the journey with Plan for 13 years? A: I want to fight for the rights of children, especially girls. Girls are often the most vulnerable in impoverished regions. I want to amplify the voices of girls and let more people know about the dire situations of girls. Shreeram has been serving the community for more than a decade by communicating the needs of children and families to the outside world. Q: Nepal was stuck by an earthquake in 2015. How are the affected? A: The affected I met during my visits are eager to rebuild their lives. They have learnt how to build houses and schools and are actively involved in the rehabilitation. They have proved that even after the toughest time, long term and positive changes can be brought to the community if there are help and support. Working for the Nepalese community at Plan is a dream come true for Shreeram. 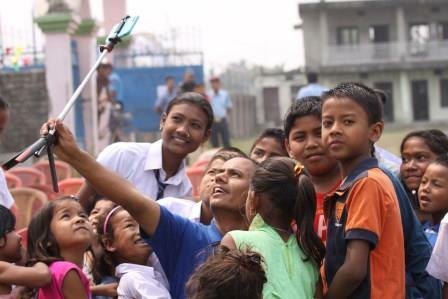 As a passionate development worker, Shreeram will continue to help underprivileged children and their families in Nepal by spreading the stories of Nepalese so that more people will know their situation and lend them a helping hand!